Whole genome duplication events have played an important role in the evolutionary history of plants. Vallejo-Marín et al. 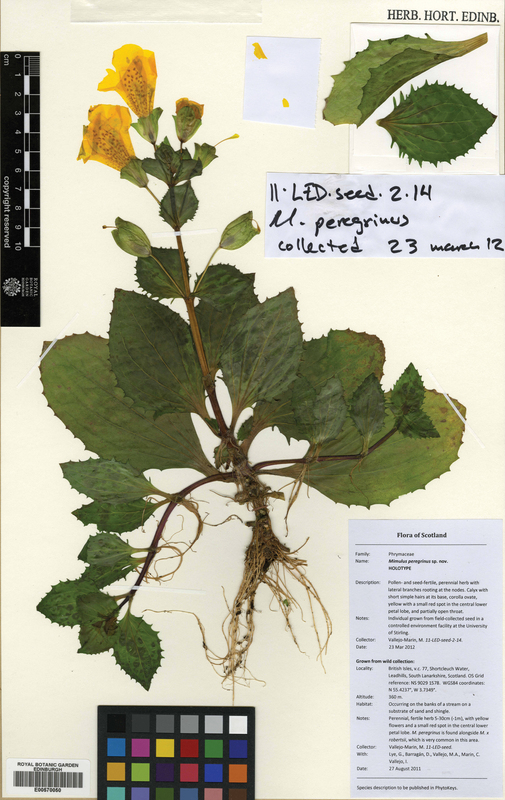 (2015) describe origins of a new polyploid species, Mimulus peregrines, found on the Scottish mainland as well as the Orkney Islands. It was formed within the last 140 years and corroborated by chromosome counts. Holotype of Mimulus peregrinus. Vallejo-Marín 2012 PhytoKeys 14: 1-14. Much of the knowledge about the early evolution of polyploid species stems from young allopolyploid species from four families, but could certainly benefit from the addition of other recent polyploidization events. In this new Evolution paper, Vallejo-Marín et al. (2015) describe the genome composition of M. peregrinus and whether it originated multiple times. Using high-depth sequencing, they were able to confirm the parentage of M. peregrinus from a sterile triploid hybrid between two introduced species that are widespread in the UK. Although the triploid suffers from acute sexual sterility, it is not an evolutionary dead-end. Its ability to propagate via clonal reproduction has allowed this taxon to become part of the ecological landscape of riparian habitats in the UK and from it the fertile allopolyploid M. peregrinus has emerged. But what about the long term prospects of M. peregrinus? All new allopolyploids have limited genetic diversity, but the multiple origins and rapid genome evolution in M. peregrinus could provide it with the variation that is necessary to be successful. Whether it will remain a short-lived scientific curiosity [which will eventually be extinct in the wild] or spread well beyond its place of origin … remains to be seen. This entry was posted in bioinformatics, evolution, genomics, natural history, plants and tagged genomics, invasion, polyploids. Bookmark the permalink.